Housed in part of a monastery dating from the 11th century, the National Museum of San Matteo is a must for those eager to retrace the history of medieval art in Pisa, but also provides an interesting few hours for casual browsers. The museum has several permanent collections of Pisan art through the ages, covering painting from the 12th to the 15th centuries, medieval ceramics and sculpture from the 14th and 15th centuries. The collections, though limited in scope, provide an interesting insight into the trends, and the movers and shakers, of the local art scene throughout the first half of the last millennium. Particularly impressive are the various painted crosses in the 12th-century collection, and the painted Islamic ceramics used in Pisan churches from the 11th to the 13th centuries. Of particular interest are the sculptures from various churches in Pisa, brought here to preserve them from increasing environmental pollution and replaced by copies in their original positions. The statues by Giovanni Pisano come from the baptistery, the famous "Madonna del Latte" (c. 1340) from the Church of Santa Maria della Spina. 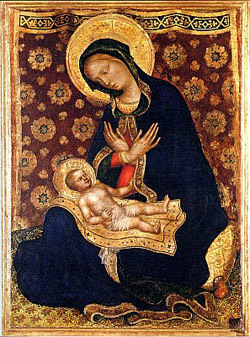 Painting is represented by a number of 12th and 13th century crucifixes, panel-paintings by Simone Martini, Giovanni di Nicola, Benozzo Gozzoli and many others. The building that houses the museum is striking in itself, as in many places the walls still show the original paintings and decorative patterns that were applied in the late Middle Ages. Some of these geometric patterns, highly in vogue at the time, show remarkable similarities to the patterns on the Islamic bowls of the ceramic collection, hinting at the influence of the Islamic world on coastal Italy at the time.